Updated July 22, 2018: see the bottom of this post for change log. Yes, you read that right. Item Numbers. This is some next-level Field Notes nerdery you’re about to witness. All in good fun, of course. Item numbers on Field Notes memo books are most likely found on the front upper-left corner of each pack’s belly band, in the format “FN-##”. Belly bands are easily discarded, leaving the memo books free of the item number, but there are some COLORS editions where the item number plays a more prominent role in the product design and packaging. National Crop and Workshop Companion come to mind as good examples. As my Field Notes collection grew, I started noticing these item numbers, not just on the memo books but also on other types of products from Field Notes, e.g. pin-back buttons, rubber bands, carpenter pencils, etc. 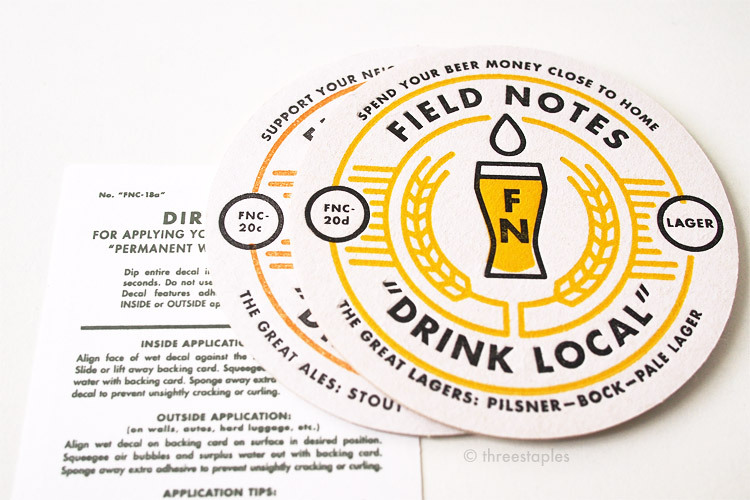 It became a small detail I started looking forward to with each new offering from Field Notes, as I consider it one of their quirky charms. I also started wondering if there was any rhyme or reason to the item numbers. 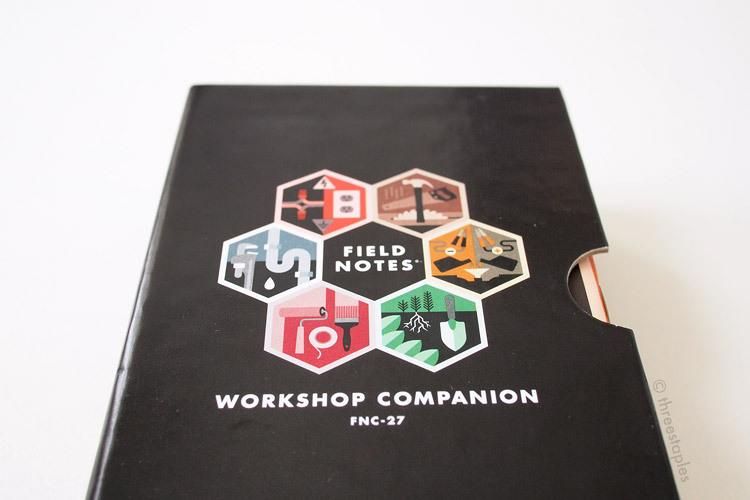 Like, when did they start assigning “FNC” to Field Notes COLORS editions? What’s item “FN-12”? So here I attempt to research and compile lists of all known item numbers, with some interesting observations and comments mixed in. These lists will be updated as I learn more. Feel free to correct or add by leaving comments at the end! “FN-01” is quite a versatile number. It is used on the Original 3-pack of “Graph Grid” memo books, as well as many of the earlier COLORS seasonal editions. It is also used on some of the branded memo books. More on this in the following sections. “FN-13” refers to both the Carpenter Pencils and the single kraft sheet 1-year calendar that is often included with Field Notes orders during the holidays. Oops! I wonder when Field Notes started keeping track of all the item numbers. They must be by now, right?!? “FN-11” is used on both the kraft 1-inch buttons and the Dry Transfer edition, which was the 10th COLORS edition. More on this in the next section. To be clear, I’m not pointing out these mis-numberings to be critical or mean; in fact, I think these show us the human side of Field Notes as a company and how their lineup grew organically. Note “FN-01a” and “FN-01b”: they are both COLORS editions that sort of got reinterpreted as regular offerings (Fire Spotter to Red Blooded and County Fair to, well, County Fair). I am unsure if FN-01 vs. FN-01a for County Fair denotes original printing vs. subsequent printings, as I did not get County Fair until much later. Interestingly, Pitch Black and Cherry Graph (which are offshoots of Night Sky and Shelterwood from COLORS), have their own distinct FN numbers. Belly bands on most of the earlier Field Notes COLORS editions, from the 1st edition (Butcher Orange) to the 13th edition (Northerly), were printed “FN-01”, which is the same number assigned to the Original kraft 3-pack “Graph Grid”. Many of them are also simply titled “Graph Paper” on the belly band, instead of the edition’s name. I am not surprised, as using the same belly band design (thus the same item number) was probably more economical in the beginning. A sign of a humble beginning perhaps, when Field Notes probably didn’t know how long the COLORS series would last. The first COLORS edition to get the appropriate “FNC-##” is National Crop from Spring 2012. For these lists, I am going with the item numbers that were labeled on the actual products. Field Notes retroactively assigned “FNC-##” to the first 13 COLORS editions, as evidenced in this official COLORS chart, except for Dry Transfer “_______ Edition”. That edition is conspicuously missing a number, perhaps appropriately so. But Field Notes used “FN-11” on the Dry Transfer Kit; you can see it on the kraft card stock and the carrier sheet that were included in the edition. The Dry Transfer Application Template is numbered “FN-11b”, which is downloadable here. Whether “FN-11” is the actual edition or the “extra” materials that make up the kit is up to you to interpret. As mentioned above, “FN-11” is also used on the kraft 1-inch buttons. As far as as I know, Packet of Sunshine from Spring 2010 (“FNC-06”) does not have an item number printed on the item itself. Drink Local editions are collectively labeled “FNC-20” on the official chart, but the belly bands of “Ales” and “Lagers” are labeled “FNC-20a” and “FNC-20b”, respectively. The same thing with Utility. Utility Graph and Utility Ledger are collectively “FNC-34”. Workshop Companion books have their own numbers printed on the spine. For example, the “Painting” book is labeled “FN WCS 04”. The format “FNC-##” will have to expand to “FNC-###” in 2033. By my calculations, the 100th (!!!) edition of COLORS will be the fall edition of 2033. Who knows what the future holds for Field Notes, for any of us fans really, but I'm pretty giddy about it already. Live long and prosper, Field Notes! Depending on the state, more recent printings of County Fair are labeled with “FNC-07” on the belly band, instead of FN-01/FN-01a. The letterpress card and envelope from Balsam Fir don’t have any special item numbers printed on them. Same is true for the triangular, embroidered logo patch from National Crop. The map from National Crop and the button from Traveling Salesman don’t have their own numbers; they are simply printed with their “parent” item numbers, “FNC-14” and “FNC-16”, respectively. I think it’s safe to assume that the bonus materials related to quarterly editions will have an item number “FNC-##x” from now on, where ## refers to the edition’s number and x is a letter. As you may have noticed from the first list, the temporary tattoo that was included in the 12th edition (Fire Spotter from Fall 2011) is numbered “FN-15”. Clearly the practice of numbering the bonus materials “FNC-##x” started much later, with the 2013 spring edition, America the Beautiful. Thanks for reading this far! If you can fill any of the blanks or have corrections, do let me know by leaving comments below. I will update this post as new items are released. I may even make a separate, static page with the same content as above, and link it as a reference page in the LINKS page later. Stay tuned. Who knew that there was THIS much to talk about item numbers. Ha! Added the Summer 2018 quarterly edition Three Missions (FNC-39), Crew Capsule Models (FNC-39a, FNC-39b, FNC-39c), and Press Sheet Set (FNC-39e). Added the Spring 2018 quarterly edition Coastal (FNC-38a and FNC-38b) and Starbucks “Coffee Farm” (FNSBR-06b). Added the Signature series (FN-42 and FN-43) and Heartbeat 2-Pack (FNW-02). Added Haxley Press Sheet, Bellroy Zippered Pencil Case, and various Kits. Added FNC-30b and FNC-30c (Commemorative Reprint 2-Pack), thanks to Dominic Flask’s comment below. Added FN-17a (Archival Box Divider Tabs), FN-29 (the “2016 Best Year Yet” 1-inch button), and some notes about County Fair. Huge thanks to Bryan Bedell for pointing these out! Finally, FN-14 is identified! It's the Work Station Calendar from 2012. Thanks to this tweet by @Felling. Added item numbers for the revamped Pitch Black and Bellroy x Field Notes leather case and memo books. Added FN-08 (older 18-month calendar) and FN-12 (bigger 18-month calendar), thanks to these tweets by @Felling! Added FN-16 (6-Inch Pocket Ruler), thanks to this tweet by @jeffrey_drake!